DOGHEAD MOUNTAIN, Colorado — Cary Weldon bought a 26-acre spread in rural Garfield County, Colo., in 1976. It was his own slice of rugged Western paradise, in a landscape he had come to love during annual hunting trips. Weldon’s secluded spot on Doghead Mountain is on a wooded rise above Battlement Creek, reached by a dirt road that climbs through thick stands of aspen and pine en route to the White River National Forest. These days, Weldon spends five blissful months each summer at his stately log home, high above the bustle of Parachute and Battlement Mesa, small towns that have ridden the roller-coaster of oil and gas booms and busts over the decades. Like most Western landowners, Weldon has a deed to his property, but he doesn’t own the rights to the minerals underneath it. Energy companies lease the subsurface mineral rights from the person or agency that owns them — often the federal Bureau of Land Management. A landowner has little say in whether or not drill rigs roll onto the property, aside from often hard-fought agreements to contain surface destruction. But Weldon’s land is different: His ranch sits atop the site where, in 1969, scientists with the Atomic Energy Commission detonated a 40-kiloton underground nuclear explosion. The blast was part of Project Plowshare, an attempt by the Atomic Energy Commission (now the Department of Energy) to find peaceful industrial applications for nuclear explosion technology. 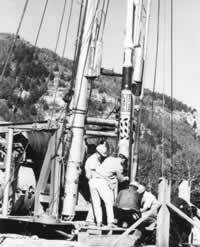 This particular experiment, known as Project Rulison, was designed to release natural gas from the tight sandstone of the Williams Fork geologic formation. Crews drilled a well 8,426 feet into the earth, used a cable to lower the long, skinny, uranium-filled fission bomb into the bottom of the well, and detonated it. Edward Teller, father of the hydrogen bomb and optimistic mastermind behind Project Plowshare, was on hand for the excitement. The experiment was only a partial success. According to one gas industry executive, it yielded "an economic quantity of gas — if you didn’t have to buy a nuclear device to (get it out of the ground)." But the gas was too radioactive to sell. Weldon knew about the land’s history when he bought the property from longtime Grand Valley rancher Lee Hayward. A commemorative plaque marks the well cap, which sits like a gravestone in the front yard. 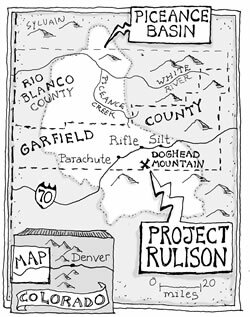 But Project Rulison had a silver lining: The blast had made the property a guaranteed refuge from oil and gas development. The Energy Department had banned drilling on the 40 acres immediately around the site, including all of Weldon’s property. Later, it had created a three-mile buffer around those 40 acres; the state was supposed to notify department officials of any drilling proposed within the buffer. Weldon says he wasn’t concerned about lingering radioactivity, because the blast had taken place so far underground and the well had been filled with concrete. Government records indicate that the site has slept soundly since the well was plugged in 1976. "(Hayward) thought the government ruined (the place), but I thought they made it," Weldon says. Now, however, Weldon voices growing anxiety as drilling edges ever closer to the nuclear blast site and his property. Garfield County, home to a big chunk of the sprawling, gas-rich Piceance Basin, is second only to La Plata County in terms of gas production in Colorado. In 2004, companies extracted 165 billion cubic feet of gas from Garfield County, enough to supply nearly 200,000 American homes for a year. In February 2004, Presco Inc., a Texas-based energy company, announced its plans to drill for natural gas in the area surrounding the blast site, and began applying for state permits. The Colorado Oil and Gas Conservation Commission has already granted some permits, and if all goes as planned, the company will drill at least 65 wells in the area, some as close as a half-mile from ground zero. Presco plans to use a technique called hydraulic fracturing to shatter the sandstone and free the natural gas inside its wells. Both the gas company and state regulators say the drilling will be safe. But Garfield County residents have recently discovered gas seeping into local water supplies, and a company active in the area has found that its drilling techniques are not as accurate as it once thought. Some local residents are asking whether drilling so close to Project Rulison could unleash the radioactivity inside Doghead Mountain. "Are they going to turn loose something deep down in the ground there that’s been asleep for a long, long time?" wonders Weldon. The 35th anniversary of the Project Rulison nuclear detonation passed without ceremony last fall. Even among the residents of the small towns near the blast site, the event seems to have slipped quietly out of the public consciousness. But one man, Chester McQueary, is trying to keep the memory of the experiment alive. A seasonal Parachute resident and former beekeeper, McQueary is a longtime anti-nuclear activist who has the distinction of having been on top of Doghead Mountain when the blast went off on Sept. 10, 1969. The Atomic Energy Commission paid everyone who lived within five miles of the site to evacuate the area for the day. But McQueary stayed, parking himself atop the mountain in plain sight, as an act of protest (HCN, 12/12/94: He felt the earth move when scientists nuked western Colorado). He was lying on the ground when the bomb was detonated, he says, and the blast’s shock wave threw him into the air: "Rocks moved there that day that hadn’t moved in tens of thousands of years." Between 1958 and Project Plowshare’s demise in 1975, the Atomic Energy Commission conducted 27 nuclear tests. Projects with names like Gnome, Vulcan, Marvel and Gasbuggy were scattered across sites in Alaska, Nevada, New Mexico, Mississippi and Colorado. The government envisioned using nuclear blasts to carve out mountainous highway and railroad cuts, excavate canals, harbors and open-pit mines — and release natural gas. At Project Rulison, the Atomic Energy Commission partnered with Texas-based Austral Oil Company and Nevada-based CER Geonuclear. Following the blast, in 1970 and 1971, the companies burned off, or "flared," 430 million cubic feet of gas into the open sky. The commission said that the level of radioactivity in the air surrounding the site did not exceed normal background levels. Crews dug up contaminated soil and shipped it, along with the drilling and excavation equipment, to a burial site in Beatty, Nev. Today, the site, along with other areas contaminated by nuclear testing, is managed by the Energy Department’s Office of Environmental Management, which is based near the Nevada Nuclear Test Site. The radioactive contamination underground is virtually impossible to clean up, however. The Energy Department says that the Project Rulison blast created a chimney-shaped cavern about 152 feet wide, which is loosely filled with rock that caved in after the blast. The chimney is surrounded by a "fracture zone" that stretches more than 200 feet into the surrounding rock. Studies of more than 900 nuclear blasts at the Nevada Test Site suggest that the Project Rulison blast vaporized the sandstone and fractured the rock around it. When it started to cool, radioactive particles, or radionuclides, became trapped in cooling gasses that liquefied and eventually hardened into glass at the bottom of the cavern. The glass created a relatively safe container for most of the radioactive materials, according to scientists, because it would have to dissolve to pose any danger. Radioactive by-products of the blast, including tritium, krypton-85 and carbon-14, still concern the Energy Department. All three of these radioactive isotopes are known to be extremely mobile in gas and water. In drinking water, tritium and carbon-14 readily absorb into the bloodstream and may cause cancer. Exposure to gas containing krypton-85 damages skin tissue and can also lead to cancer. Tritium is the "primary contaminant of concern over the next 100 years, because it is one of the most mobile radiologic contaminants and is found in abundance" at the test site, according to a March 2000 Energy Department report. The report also notes that "no proven and cost-effective technologies exist for the removal of radioactive contamination from groundwater at these depths." As a result, the department tests water in wells surrounding the blast site each year, and is getting ready to conduct computer modeling of the immediate area surrounding ground zero, in order to estimate the potential for movement of radioactive isotopes. Pete Sanders, who oversees Project Rulison for the Energy Department’s Environmental Restoration Division, says that in 1997, the department sampled several long-established gas wells in the Project Rulison area. The closest well was about three miles from the blast site, and tests revealed no radioactive contamination. At that time, the Colorado Oil and Gas Conservation Commission agreed to notify the Energy Department of any future requests for permits to drill within three miles of the sealed Rulison well. The three-mile radius was an arbitrary figure, Sanders says, designed to give the blast site ample space. "There’s no legal requirement. It’s just something we agreed to," Sanders says. When Presco announced its intention in February 2004 to drill inside the three-mile radius, Sanders says, the Energy Department hastened to develop a computer model for the Project Rulison site. The department quickly created a "rough" model and presented it to the Colorado Oil and Gas Conservation Commission as a "very conservative model based on information gathered by other companies," Sanders says. The model suggested that drilling even a half-mile from the site would be safe, but Sanders points out that much more work is needed: "We haven’t had a chance to do our real modeling. Everyone has to do their research and see what’s out there," he says. "It’ll be two years down the road before the model is approved by everyone that needs to approve it." The lack of a complete model has not slowed the oil and gas commission. It has approved permits for wells one mile from the Project Rulison blast site, and the administrative process for permitting the first gas well a half-mile away is moving ahead. The commission’s director, petroleum engineer Brian Macke, says that the state is not being reckless. Soon after Presco initiated its permit process, the state banned any drilling within a half-mile of the Project Rulison blast site, basing the decision on the Energy Department’s rough model, says Macke. "We wanted to err way on the side of caution in picking a radius like this," Macke says. Kim Bennetts, vice president of exploration and production for Presco, says that a 1998 report confirms that the site is safe. The report, written by Macke, was essentially a "literature review" of 30-year-old studies. 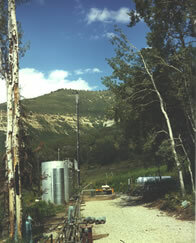 The report’s most recent data are from the 1997 well tests three or more miles from the blast site. Macke says Presco will be required to report daily to the local Colorado Oil and Gas Conservation Commission staff during the drilling. "It’s kinda like double suspenders, but we felt like this is appropriate in this case," Macke says. Bennetts says his company is not required to do any special monitoring, however, because the state of Colorado has no jurisdiction over the Project Rulison site — a statement confirmed by Steve Tarlton, radiation management unit leader for the Colorado Department of Public Health and Environment. "There isn’t a structure in place to deal with a lot of this stuff," says Tarlton. "We remain interested in it. We watch it. We watch it just like you do. We read the newspapers." Despite the lack of regulatory oversight, Bennetts says, Presco plans to do extensive testing. He says Presco will use the same testing lab that the Energy Department uses, and if any radioactivity comes up, the company will plug the well and cease drilling immediately. "We can’t sell radioactive gas. The liability would be humongous and we’re worried about workers up there, too," Bennetts says. But Bennetts also says he doesn’t anticipate any problems because the dense rock in the Williams Fork formation around Project Rulison is "virtually impermeable to the flow of gas." He acknowledges, however, that the company plans to use hydraulic fracturing, or "frac’ing," to shatter the sandstone and release the gas inside the wells (HCN, 12/20/04: Conscientious Objectors). "It’s the only way to get the gas out of that real tight sandstone," he says, adding that the chances of Presco’s cracking into the Rulison fracture zone are slim. "It doesn’t matter whether or not we fracture into it," he says. "They burned all the radioactive gas off in 1971." Many local people are not convinced that the sandstone under Doghead Mountain will keep lingering radioactive materials safely contained, however — and recent events seem to bear out their concern. Parachute City Councilmember Judi Hayward is no enemy of the oil and gas industry. She has profited handsomely from leasing mineral rights elsewhere in Garfield County. She inherited the rights from her husband, Lee Hayward, when he died in 1998. It was Lee’s father, Claude, who allowed the Atomic Energy Commission and private industry to use his ranch for the Project Rulison explosion in 1969. In exchange for allowing the blast on his property, Claude got $100 and a promise of all of the proceeds from the sale of the gas. There were, of course, no proceeds. Though she would profit from gas development near Project Rulison, Hayward, who lives in a cabin near the site, has mixed feelings about the proposal. She says she is impressed with Presco’s efforts to meet with locals, answer their questions, and build safeguards into the drilling system. But, she says, "I don’t want them any closer than a half mile — and I’d feel a lot better if it was a mile. I just think we need to be pretty cautious." Part of Hayward’s unease comes from firsthand knowledge of the Project Rulison cleanup. In the mid-1990s, the Energy Department told Hayward about diesel fuel in the "skinny-dippin’ pond" that her husband, an outfitter and guide, had stocked with fish. It turned out that the diesel-laden mud had been sitting at the bottom of the pond since Project Rulison was originally drilled, but it took increased environmental monitoring by the Energy Department in the 1990s to spur a cleanup. Hayward says the department drained the pond, released the fish into the nearby creek, and hauled hundreds of truckloads of dirt from her property. Local concerns were heightened last March by the discovery of a gas seep that was contaminating West Divide Creek, along with drinking-water wells near the town of Silt, just east of the Project Rulison site. The seep percolated from a natural gas well to the water through the same type of sandstone found around Project Rulison. In response, the Colorado Oil and Gas Conservation Commission fined the driller, Canadian energy giant EnCana Oil and Gas, $371,200 — the largest fine in the commission’s history. Many residents say the gas seep shows that the sandstone around Project Rulison is not as impermeable as the gas industry believes. "It concerns me that that permit is coming up and nobody has put any special stipulations on it before it’s approved," says Mary Ellen Denomy, a minerals expert from Battlement Mesa who has spent the past eight years negotiating for the rights of surface owners who have energy developers on their land. A member of the Grand Valley Citizens’ Alliance, Denomy says her group wants a backup plan in place to seal Presco’s well and clean things up if radioactive contamination gets into the water or soil. She says the citizens’ group asked Presco to put up extra bond money to cover cleanup costs in the case of radioactive contamination, but the company declined. More concerns bubbled to the surface in December, when Denomy told the Garfield County commissioners about a recent study questioning the accuracy of some natural gas drilling. The study, done by Tulsa, Okla.-based Williams Production RMT Company, one of the largest gas exploration companies working in the county, found that some of the company’s gas wells missed their target by 300 to 400 feet. At the least, this creates headaches for bordering mineral rights owners. But more importantly, Garfield County critics say, it undermines Presco’s assurances that "pinpoint drilling" will keep wells safely outside the half-mile radius of the Project Rulison blast site. Wesley Kent, a neighbor of Hayward and Weldon, has almost finished building a house on his property. He has past Nuclear Regulatory Commission training on his résumé, and he says he’s always felt comfortable with the Energy Department’s handling of the site. But these days, he says, he is angry at the new willingness to "drill so close to the unknown." "My simplistic view is (that it’s) like living below a dam," Kent says. "But now we’re going to drill a hole in the dam." "I’m always mystified about a lot of the things that happen in the gas industry," says Grand Valley Citizens’ Alliance President Duke Cox. "They are making money so fast they’re intoxicated by it." Comments from concerned citizens seem to be paying off. Although Presco initially said it planned to drill wells a half-mile from Project Rulison this spring, the Garfield County commissioners and the oil and gas commission have now decided they want a special hearing before the commission issues the permits. This effectively puts the closest wells on hold, at least until next summer. 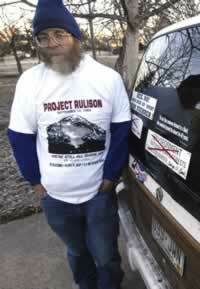 Project Rulison "shouldn’t just go down the memory hole," says anti-nuclear activist McQueary. He is heartened to see community members speak out against the danger of punching holes in the earth so close to the blast site. But regardless of what the state decides to do near Project Rulison, this probably isn’t the last word on gas exploration near old nuclear blast sites. On May 17, 1973, the Atomic Energy Commission detonated three separate 33-kiloton nuclear explosions more than a mile under ground, northeast of Project Rulison between Meeker and Rifle. They called it Project Rio Blanco, and it was the final Plowshare experiment. The Energy Department’s Sanders, who is project manager for both the Rulison and Rio Blanco sites, says that in August 2004, the oil and gas commission notified his department of an application to drill new gas wells on BLM land within two-and-a-half miles of Project Rio Blanco. The application came from EnCana, the company responsible for the gas seep in West Divide Creek. The commission approved the permits in August and September. An EnCana spokesperson said the company drilled two exploratory wells in 2004, but its future plans for the site are uncertain. The company has named the wells "Eureka." The author is working on a master’s degree in journalism at the University of Colorado in Boulder. - Whose rules rule on Otero Mesa? Whose rules rule on Otero Mesa?